Day 01: Pickup from airport Paro (2280 mtrs). The flight to Paro is one of the most spectacular of all mountain flights. One can see the Mt. Everest, Mt. Kanchanjunga, Mt. Makalu and other peaks in Bhutan such as Mt. Chomolhari, Mt. Jichu Drakay, and Mt. Tsherimgang. The green wall of hills known as the doors or gateways into Bhutan from the plains climbs continually higher as down the forested mountainsides, and to the north, the great snowcapped peaks of the inner Himalayas rise up to the sky. As your flight lands in Paro .You will meet our representative at the airport and will be driven to check in hotel and later visit Paro Dzong and the Paro town. Overnight in Paro,Jigmiling Hotel. After breakfast visit Drukgyel Dzong and Kichu lhakhang(Temple). Kichu lhakhang, one of the 108 temples built in the 7th century by the Tibetan King Songsten Gampo. The story goes that a giant demon lay across the whole area of Tibet and the Himalayas and was preventing the spread of Buddhism. To overcome her, King Songtsen Gampo decided to build 108 temples, which would be placed on all the points of her body. Of these 108 temples, 12 were built in accordance with precise plans. Thus, it happened that in about the year AD 638 the temple of Jokhang in Lhasa was built over the very heart of the demons. After lunch drive to Thimphu. Once you reach visit the Changangkha monastery,and after the monastery check into Hotel Phuentsho Pelri.Later in the evening take a stroll in the capital City. In Thimphu you will visit places as mentioned below. Memorial Chorten where the older people continuously circumambulated, murmuring mantras and spinning their prayer wheels. Construction of this landmark was the idea of Bhutan’s 3rd king, His Majesty Jigme Dorji Wangchuk (“the father of modern Bhutan”) who has wished to erect monument to world peace and prosperity. Completed in 1974 after his untimely death, it serves both as a memorial to the Late King and as a monument to peace. Zorig Chusum (commonly known as the Painting School) where students undergo a 6-year training course in Bhutan’s 13 traditional arts and crafts. Later visit Folk Heritage Museum, a fascinating testimony of the Bhutanese material culture and living traditions. Please note at this time of the year it is the mid-term examination period and you may not be allowed to visit the school. Phelchey Toenkhyim (Folk Heritage Museum), is dedicated to connecting people to Bhutanese rural past through exhibits, demonstrate, educational programmed and documentation of rural life. The principal exhibit in the museum is a restored three-storey traditional building, rammed with mud and timber, which dates back to mid 19th century. In order to present a typical Bhutanese rural setting flavor, paddy, wheat and millet fields, a traditional watermill (with mill stones that dates back more than 150 years), traditional style kitchen gardens with vegetables that were grown and consumed over 100 years, and the famous hot stone bath complement the meseum building and exhibition within. Takin, the national animal of Bhutan is said to be created by Lam Drukpa Kinley. Tashi cho Dzong: The fortress which holds the office of the King,His Majesty Jigme Keshar Namgyal Wangchuk and two ministries,Finance and Home and Culture Affairs. It is also the summer residence for the monk body. Simtokha Dzong: The oldest dzong of Bhutan .It was built in the year 1627. Overnight in Thimphu in the same hotel. Drive to Punakha (driving hour 2.30hrs), the old capital of Bhutan. Drive over a pass (Dochu-la 3150mtrs).La in Bhutanese means pass. There are 108 chorten called “Druk Wangyel Chorten” with colorful prayer flags surrounding the area, which makes you fresh and feel peace. 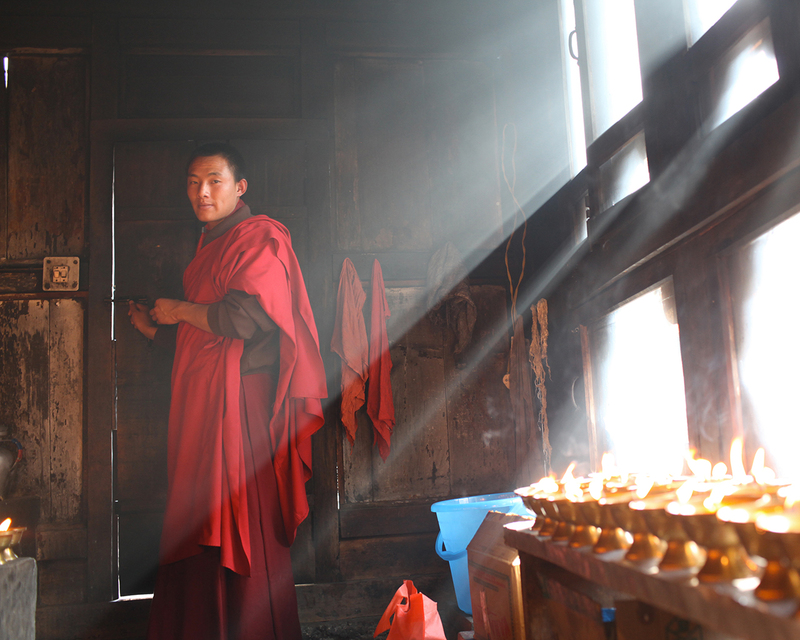 Visit the Druk Wangyel monastery. If the sky is clear this provides the best place to see and take photos of Himalayan snow capped mountains ranges which borders Tibet(China),the following are the names of the peaks which can be seen from this pass (left to right): Masagang (7,158m), Tsendagang(6,960m), Terigang (7,060m), Jejegangphugang (7,158 m ), Kangphugang (7,170 m ), Zongphugang (7, 060 m ), a table mountain that dominates the isolated region of Lunana, finally Gangkar puensum, the highest peak in Bhutan at 7,497m. After that we drive down the hill till we feel the warm air of Punakha valley. In Punakha visit Punakha Dzong: The Dzong was built in 1637 by the unifier Zhabdrung Ngwang Namgyal and it was named as Pungthang Dechen Phodrang (Palace of Great Happiness). The Dzong is beautifully located in between the two rivers called Pho (male) and Mo (female) chhu (river). The Dzong is surrounded by stories and myths, and you just have to ask your guide or local people they will have some great stories of the past. It was the capital of Bhutan till 1955. The establishment of the Wangchuck dynasty on 17th December, 1907 took place here and the first National Assembly was also held in the Dzong in 1953. Punakha dzong continues to be the winter residence of the Je Khenpo (Chief Abbot) and the central monk body. The war materials captured during the Tibetan invasion can be found in the dzong. Chimi Lhakhang, is a small 15th century temple famous for its fertility endowments/rites due to the blessings of Lam Drukpa Kuenley in west known as Devine Mad Man. The temple sits on a hillock shaped, as only Drukpa Kuenley could describe it “like a woman’s breast”. 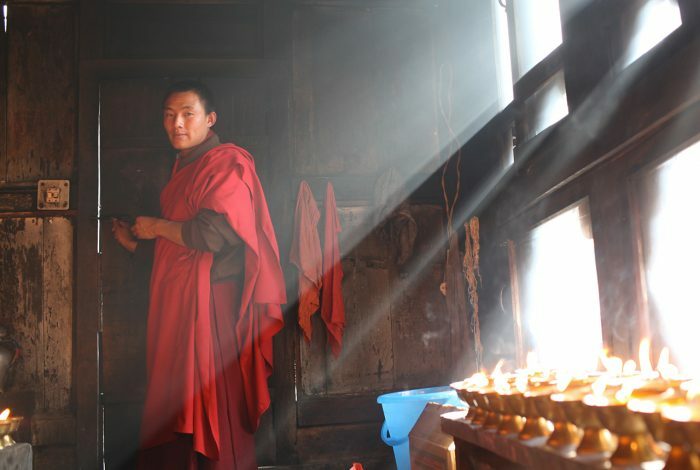 The word ‘Chimi’ translates as “No Dog” and is traced to the story of how Drukpa kuenley subdued the demons of Dochula. Apparently, Lam Drukpa Kuenley had followed the demons of Dochula down to the velley of Punakha and Wangdue. It is believed that the demons had disguised herself into a form of dog. He then subdued the dog and buried it under a mound of earth, marking the place with a stupa and making a prophecy that a temple would be built on the spot in future. Overnight in Punakha, Hotel Kingaling . Day 5: Drive to Bumthang. After breakfast we drive to Bumthang. On the way we visit Trongsa Dzong, built in the year 1648.This Dzong holds a great historical importance. It is customary for all the Kings of Bhutan to be invested as the Trongsa Penlop( Governor) prior to ascending the throne. You will be thrilled by the massiveness of the Dzong that literally covers a hill top. After the Dzong we carry on with our journey to Bumthang.Have lunch in Trongsa. We pass through Trongsa town, and slowly climb up towards the Yotongla pass, the highest pass on your journey. After the pass we descend for Bumthang through the pine forest. Overnight at the Mepham guesthouse. Bumthang has an individuality that charms its visitors and separates it from other regions.People often refer to it as the Swiss of Bhutan.It is also one of the most religious place in Bhutan. Comprised of four valleys, here tales of Guru Padmasambhava still linger in most nooks and corners .Here you will visit Bjakar Dzong and Membar tsho (The burning lake).In the afternoon visit the Bumthang town and later relax for the day. Overnight in the same hotel. Day 7: Bumthang, visit Chokor toe region. Today you will walk in the Chokor toe region and visit the religious places as Jambay lhakhang,Kurjey Lhakhang and Tamshing lhakhang if possible. Overnight in the same guesthouse. Day 8: Bumthang, visit Tang region. After breakfast drive to Tang valley and later walk to Ugyencholing,we will begin our walk through rivers, across bridges and up the mountain side making our way towards the Museum. This Museum, once a royal palace, is a nice place to take a break and enjoy a light lunch and tea before exploring the numerous artifacts and treasures inside. After visiting the Ugyencholing museum walk down the village to the motor road and drive back to Bjakar. Day 9: Bumthang to Wangdi. After breakfast, travel to Gangtey Gompa . Visit Gangtey Gompa, which now houses one of the only Nyingmapa monastery in Bhutan. The valley is also the winter home to the rare black-necked cranes (Grus Nicorocolis), which migrate, from remote parts of Tibet, China and Siberia during winter to this valley. Drive to Wangdue for overnight stay in hotel Kingaling. Day 10: Wangdi to Paro . Taktshang: After an early breakfast visit the Tiger’s nest (Taktshang) Hike up to the famous cliff-hermitage called Taktsang, the “Tiger’s Nest.” This monastic retreat is built into a sheer cliff face, high above the Paro valley. The Buddhist saint Padmasambhava flew across the Himalayas on the back of a tiger and landed here, bringing Buddhism to Bhutan. The trail to the monastery climbs through beautiful pine forest and an occasional grove of fluttering prayer flags. Taktsang was damaged severely by fire in 1998 and restored new one which looks like the old one but more elegant lookings. Have lunch at the Cafeteria when you walk back from the Taktshang. Overnight in hotel Jigmiling. Drive to airport for your onward destination. Our representative will help you with exit formalities and bid you farewell.